A tall, stately tree that can grow up to 80 metres when mature. Needles are flat with rounded and notched ends. They are dark green and grooved on top with two white bands underneath. Needles are arranged to form flat sprays that show both the upper and lower surfaces of the twig. Seed cones are barrel-shaped and yellowish-green, growing upright on the branches, high in the crown. 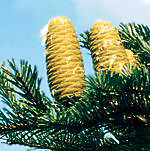 The cones shed the scales with the seeds during autumn. 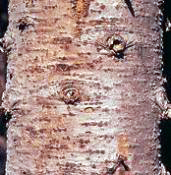 The bark is smooth and greyish-brown with white spots and blisters filled with gummy resin when young. The bark becomes furrowed and scaly with age. It is found from sea level to mid elevations along the southern coast and around the Kootenay and Columbia rivers in the southern Interior. 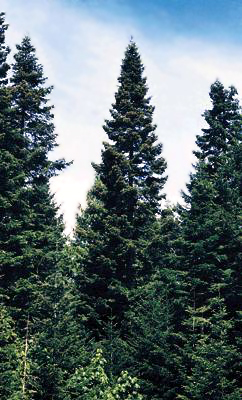 Grand fir prefers drier climates than the other true firs in British Columbia. In the Interior, it commonly grows in mixed coniferous forests with Douglas-fir, western hemlock, and western white pine, and with queen's cup, falsebox, and prince's pine on the ground below. On the coast, western redcedar and flowering dogwood may also be present, with salal, Oregon-grape, western trillium and vanilla-leaf beneath. These forests are often home to bears and cougars; owls and woodpeckers; and toads, frogs and salamanders. Grand fir, like other true firs, has a thin bark which makes it susceptible to fire. It has increased in abundance since forest fire fighting activities began. The Okanagan people built canoes from grand fir bark and rubbed its pitch on paddles to give them a good finish. They also applied pitch to the back of bows to provide a secure grip. Kwakwaka'wakw shamans wove branches into headdresses and costumes; they also used branches for scrubbing before rites and rituals. The Hesquiat made branches into incense and decorative clothing for wolf dancers. They also rubbed the pitch mixed with oil on their scalps as a perfume and to prevent baldness. Many of the true firs are incorrectly called balsam. The true balsam fir (Abies balsamea) is found east of the Rocky Mountains.